There are many moments in US history that should never been forgotten. Since I deal with money, there are certain moments in the financial history that should also not be forgotten. I've often said that you should not listen to people who tell you what you do with your money. It is YOUR money. You decide what to do with it on your own terms. This doesn't mean not to listen to what experienced financial teachers teach, experts offering up sound advice, learning about investing and money facts, and so forth. What I do mean, is when someone goes on TV and tells you buy this or sell that. It's not just TV. Friends or coworkers might tell you what to do or what not to do. Even your parents or grandparents might do it as well. For those who do not watch financial TV (like me, not anymore), you see articles everyday telling you what to do and what to do with your money. Why do people do this? It's to make money for themselves. It is not because they care about you. If nothing else, please be mindful of this when you watch financial media. I wrote an article about it earlier and will continue to do so, because it is important. I 'll never forget about the banking/housing/financial crisis of 2007-2008. I'm not going to get into the details of what happened. You can look it up if you were not old enough to remember it. The world, especially the US, was in a financial crisis of epic proportions. Many investors, especially new investors were scared and there was a whole lot of panic. When this happens, people sell everything and ask questions later. What they also do is look for help or advice on what to do. I know this extremely well because many of my clients, some of which were very experienced investors, came to me with fear and panic. While I did not lose any client accounts, I had people insist that all of their stocks and bonds be sold so that their accounts would be in cash. Their accounts like almost everyone's (including mine) were down heavily, and they could not handle it. My clients listened to me about 95% of the time. However, this is probably the greatest time in my career that they did not. Buying during this time instead of selling was probably one of the best opportunities in recent history. The market recovered and people who bought stock instead of selling, got the discount buys of a lifetime. So it's been 11 years and CNBC had an anniversary article about chief entertainer Jim Cramer ranting on the network on how the financial system at the time was messed up. How it was in deep doodoo. How the bigwigs in DC underestimated how serious the financial crisis was. I think a lot of people, investors and perhaps those bigwigs listened to him. He was sounding the alarm to the world and he was right. CNBC posted the actual video of his ranting on their website. They probably mentioned it on their station as well, but since I don't watch CNBC, I do not know for sure. Now to my point. If you know or heard about Jim Cramer, then you know he says a lot of things. As an entertainer, that's his job. A big part of his show is telling people what to buy or hold or sell, sometimes they are his opinions, sometimes they are not. CNBC can get away with this by displaying onscreen a disclaimer about what Jim says. I like CNBC most times and I while I disagree with a lot of what Jim says, and am strongly against him telling people what to do, many people new to investing tune into him. Five times a week, every week. More importantly, they listen to what he says. Thanks to YouTube, we are able to look back on videos that happened in the past. While, CNBC showed the video of Jim Cramer's famous Rant from back then. I offer readers a video that CNBC will NEVER show. I think they would rather delete it from history. It is just one reason that I stress that you should never listen to what people tell you to do with you money. I don't care if they're friends, neighbors, loved ones, coworkers, religious men, bloggers, experts, or they have a disclaimer that covers their rear-end. This video was shot days before Jim's rant. 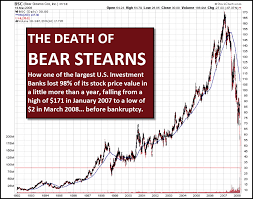 A viewer wrote into Jim what to do about the former investment bank Bear Stearns, a stock that she owned, and many others owned it too. It was a largely-held stock, which means a lot of people owned it. The financial markets were already in turmoil this point, and people, mostly beginners, turned to his show for help and advice. Because of the panic that had set in across the world, more people probably listened to CNBC and to Jim than ever before. I do not know who the woman was who called that day. If she listened to Jim, and why wouldn't she, her investment went bust. She lost everything she had in that stock. Many others did too. I'm not sure if Jim ever apologized to that woman or to anyone else who had Bear Stearns at the time and listened to him and also lost all of their money when Bear Stearns went bust. Those people lost all of their investment. They lost. Disclaimer or not. Keep Track Of Your Net Worth: Hopefully you now know a little bit more about the worst call ever made. Now the easiest way to grow your wealth is to know where all your money is going. Sign up for Personal Capital, the best free financial tool on the web. I use them and have seen my income and net worth blast off. They keep me motivated to budget, spend and invest wisely.